Shawn Pinchbeck is an Edmonton, Alberta, Canada based electroacoustic music composer and media artist. Since 1984, he's been activily performing, composing, releasing recordings, curating festivals and concerts; and for many years now teaching studio engineering, electroacoustic composition, film sound design, Max/MSP/Jitter, computer interactivity and basic electronics. 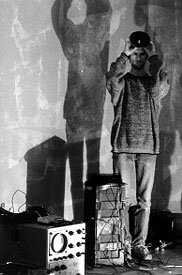 Shawn started out doing noise electronics and tape pieces using found sounds, and quickly moved into sequencer laden electronic music inspired by Tangerine Dream and Kraftwerk. In the later 80's his style developed and he created a niche in Edmonton's music scene performing regularly and received charting campus radio airplay across Canada and the U.S.. In the early 90's he got interested in acousmatic music composition and computer interactive art. He continued to compose ambient electronic music for CD release and many film projects. In the mid-90's he started creating computer interactive installations with sensors, audio and video. His recent works are varied and many including interactive audio installations, collaborative dance performances with interactive audio and video, CD recordings, film soundtracks and software design. He currently is a PhD candidate at the University of Birmingham, UK. and splits his time between Canada, Estonia, and the UK. Due to a problem, my current spinchbeck.com webpage is temporarily not working. While I figure it out, I have found the old site from 2011. Sorry for the inconvenience. The recordings on this cd mark the beginnings of Send + Receive: A Festival of Sound, a festival which I directed until 2004. On November 21, 1998, a crowd of about 100 people gathered in the Bulman Student Centre at the University of Winnipeg. No one was sure what to expect from the pile of gear installed in the middle of the room surrounded by some chairs, and four speakers (a quadraphonic mix). While Ken, Steve and Shawn began to play, the audience took up the 'invitation' to gather round. Chairs were slid to the side. The performance gradually built up layers of sound and then something totally unexpected happened. The crowd began to circle, mostly counterclockwise, in a slow orbit around the artists, moving into and out of different sound fields, creating their own ‘mix’, erasing the role of ‘passive’ audience and encouraged active participation, one that celebrates improvisation, and rewards people for getting off their asses. It was a spontaneous and beautiful reaction, to this day one of my favourite moments of Send + Receive. I have created a basic website for my Professor, Dr. Jonty Harrison at the University of Birmingham, to display my PhD research over the last 3 years. These are not the final versions of the media, but my final PhD Portfolio will be chosen from these creative projects and works. Have a peek! I will be running my installation "Sonic Spaces (the kinetics of sound)" during the Nuit Blanche festival in the NAISA space (601 Christie #252, Toronto) from October 1 - 29, 2011. On June 23, 2011, I performed at Latitude 53 Gallery in Edmonton with Gary Joynes (Clinker) and Scott Smallwood. Here's a clip from the Edmonton Journal website. Time for the next Mile Zero Dance/Shawn Pinchbeck collaborations for the Edmonton Works Art and Design Festival. "Streaming" runs from June 24 - 26 and July 1 - 3 at 4:30 pm at Louise McKinley Park, Edmonton. And, "Remote Controls" on June 27 and 29th at 2:30 pm in Churchill Square on the main stage! On January 22 and March 22, 2011, I performed at the Bohemia Cafe in Edmonton at the excellent monthly Ramshackle Day Parade events. Click on the date links for photos and full audio from the events. Here's some links to my collaboration with the Ooperkvartett in Tallinn, Estonia on September 1, 2010 for the Plektrum Festival of Visual Sound Culture. A clip from the performance and an interview with me. Active Crossover – Arnolfini Dark Studio, October 2009, Bristol, UK - My piece "The Children Are the Future" was included in this exhibit. Lithuania - I had a purposely composed acousmatic piece included in this exhibit. I just completed a piece for dance, interactivity and live electroacoustics with Mile Zero Dance entitled "Public Domain" which was performed June 27th, 2009 as part of the FEATS Dance Festival in Edmonton, Canada. I'm very happy with the results and look forward to continuing work with Gerry Morita and the rest of the Mile Zero Dance gang over the coming months. Media clips will come soon! Estonian tour of "Phases" with Fine Five Dance Theatre, Spring 2009! "Phases", a collaboration with Fine 5 Dance Theatre of Estonia, wins "Best Dance Performance in Estonia of 2008!" Check out Clips and Media below for some recent stuff.